We'd love to tell you that when it comes to statues it's the subtlety of craftspersonship that matters -- not just the height. But that would be a lie. The taller the statue, the better it is. We don't make the rules. Per these rules, there's a new best statue in the world, as the new world's tallest statue was unveiled in India on Wednesday. The Statue of Unity is an unbelievable 597 feet tall, double the size of the Statue of Liberty. It depicts Sardar Vallabhbhai Patel, a towering figure in India's fight for independence from Britain, now turned into a literally towering figure. According to a report by the The New York Times, his big toe is the height of a basketball hoop. 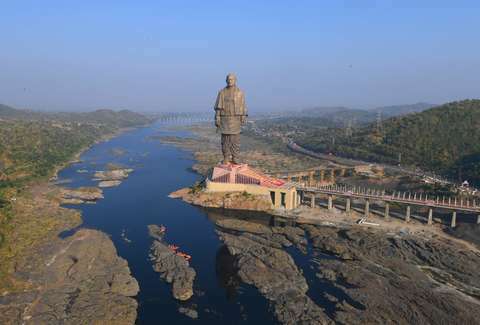 The statue, which is located in the western state of Gujarat, cost $400 million, according to a report by NBC, and used 7,416,080 cubic feet of cement, 25,000 tons of steel and 1,700 tons of bronze. Funds came from the "federal government, state-run companies and other institutions." All told, it took 33 months to build and was opened to the public on Patel's birthday. "Brothers and Sisters, this highest statue of the world will be remembered for the whole world, our future generations, the courage, strength and determination of that person," Prime Minister Narendra Modi, who ordered the statue's construction, said at the ceremony. According to NBC, the next three tallest statues are all of Buddha and are located in China, Myanmar, and Japan. Apparently, the US needs to up its statue game. May we humbly suggest one of that fan who hit a baseball player with his own homerun ball?